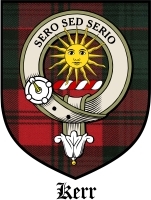 For hundreds of years the Scottish inhabitants of the borderland areas with England, in particular the central areas through which the main north-south road lay since Roman Times, had by the 1500’s become known as Kerr lands. By this time most British armies moving north into Scotland to maintain British dominance had subdued Kerr lands while clans further north usually fled northward into the highlands. The early 1500’s were a troubled time for the Borderland Catholic clans as Protestant England made repeated incursions which always ended badly for the borderland clans, among whom were the Kerrs. 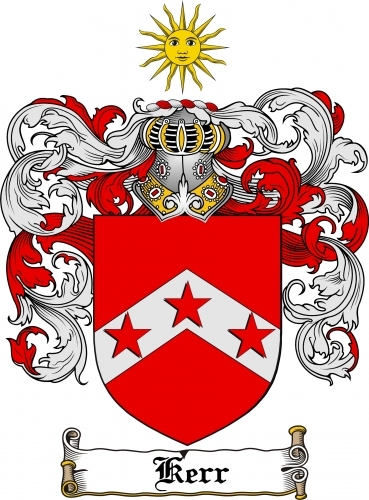 In 1544, the English Tudor King Henry VIII ordered the Earl of Hertford to to take the King's armies in Scotland to devastate Edinburgh, Leith and lay waste to all Scotland without exception. Hertford dutifully devastated much of southern Scotland in two expeditions in 1544, burning Edinburgh in May. The following year (1545) the British returned to complete Scotland’s submission, only this time a Scottish military coalition awaited the English army at Ancram Moor some ten miles north-west of Jedburgh. The British Army of some 6,000 was short of English troops. This army was relying on some 3,000 German and Spanish mercenaries, 1,500 Kerrs and some 700 other border clans forced to fight for the British. The Scottish army had chosen the time and place of the battle at Ancrum Moor. 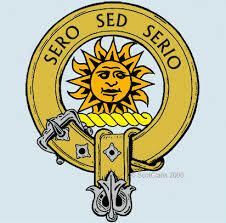 The British attacked a weaker line of Clan troops before them, and when the Scottish line broke and fled into the setting sun, the English pursued them over a nearby hill concealing the main Scottish force. With the sun in their faces chaos broke out among the English as the Kerrs changed sides. The English forces were routed. 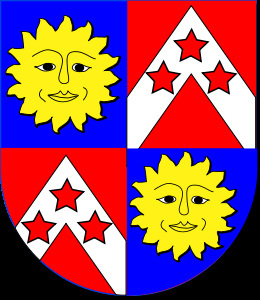 Because the Kerrs changed sides late at Ancrum Moor, but clearly contributing to the English defeat, the Earl of Arran decided the Kerr motto should be Sero Sed Serio, or “Late, but in earnest.” The Kerrs then also adopted the symbol of the setting sun, and the motto, "The sun in its splendor” which had contributed so significantly to the positive impact the Kerrs had on the Scottish victory at Ancrum Moor.